There’s a word to describe when a fictional product from a movie or TV series actually gets made in real life: defictionalization. And we’ve seen a lot of it over the years. Sometimes it’s a tie-in that leverages the popularity of a series or movie, as was the case with Tru Blood Orange Soda, which pays homage to the popular TV show about vampires. In other cases, you might not even realize that a series or movie inspired the product like the Everlasting Gobstopper, which was first introduced in the movie Willy Wonka & the Chocolate Factory in 1971. Or maybe it’s a product you didn’t realize exists in real life, like the Schweddy Balls Ben & Jerry’s ice cream flavor, which was inspired by the popular Saturday Night Live Christmas sketch. With that said, here are some defictionalized products that you might be surprised to find out were actually made after being inspired by a movie or TV series. Who would want to buy a cologne that only “works 60 percent of the time, every time?” Not to mention one that’s made with bits of real panther, is illegal in nine countries, and supposedly smells like everything from gasoline to “a used diaper filled with Indian food.” That was the description of this fictional spray that character Brian Fantana (Paul Rudd) liked to dab on himself before a night out on the town. The real version, of course, does not have panther bits, but combines notes of juniper with cedarwood and sandalwood as it evolves, and even comes in a box that growls when you open it. Chances are that the replica, made by Tru Fragrance, has ended up on many a gag gift list over the years. So you probably thought Stay Puft was an existing brand of marshmallows before they appeared as a prop in this movie, along with the Stay Puft Marshmallow Man, right? Wrong. It took 20 years, but you can now buy officially licensed Stay Puft marshmallows. They aren’t traditional marshmallows: These ones are caffeinated, and come at a premium price, in a collectable rubbery box that resembles an oversized marshmallow. Can anyone say gourmet s’mores? Hoverboards are everywhere nowadays, coming in various iterations and from both well-known companies and start-ups looking to capitalize on their popularity. Sure, today’s hoverboards don’t necessarily hover like the one Michael J. Fox used in the movie; they are technically self-balancing scooters. But it’s only a matter of time. It’s also worth noting that in 2015, the year depicted in the “future” segments of the 1989 film, Nike confirmed it would be releasing a pair of Marty McFly’s famous self-lacing sneakers for charity. 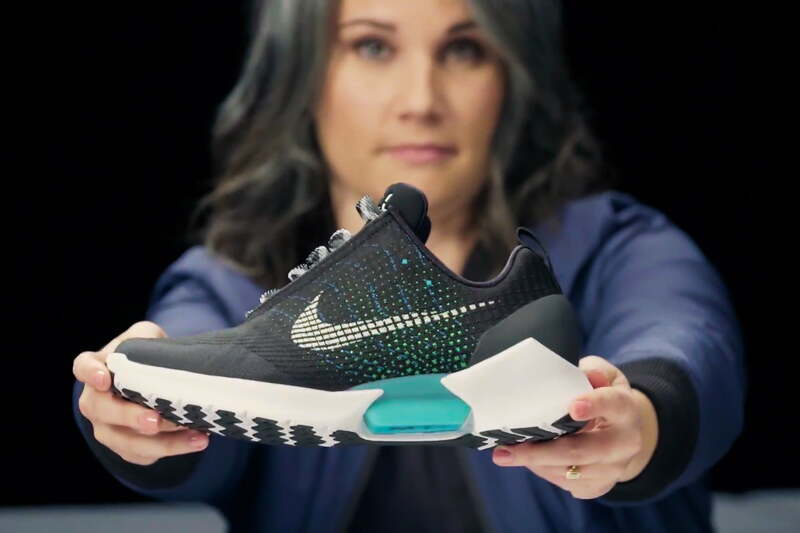 In 2016, the Nike HyperAdapt 1.0 launched in stores, and could indeed lace up on their own, just like in the movie. Dunder Mifflin isn’t a real company. But in 2011, following the immense popularity of NBC’s The Office, Staples began offering copy paper from the fictional paper sales company. The paper was licensed by Comcast and produced and sold by Quill.com, a wholly owned subsidiary of Staples. Sure, it’s just paper in a branded box, complete with clever slogans like “limitless paper in a paperless world” and “Quabity First.” But it surely brings plenty of laughs to office staff who find the boxes in their copy rooms. Swingline, a division of ACCO Brands Corporation, has been making staplers and hole punches for decades. But interestingly, the company had never launched a stapler in a bright red finish — that is, until the movie Office Space was released and shot to popularity. The stapler is a key item in the movie and is the property of shy and awkward Milton (a hilarious Stephen Root), who gets quietly agitated every time someone touches his beloved “red stapler.” Following the movie’s success, Swingline introduced an official 747 Rio Red stapler to capitalize on the demand from fans who wanted a red stapler of their very own to cherish. Richard Castle isn’t a real author. He’s just a character that Nathan Fillion played in the ABC series. In the show, Castle helps police solve crimes that include manners of death found in his mystery novels. Several of the fictional novels from the series were made into real books by Hyperion, and went on to become New York Times best-sellers. The books, based on the character Nikki Heat, weren’t written by Fillion, or an actual writer named Richard Castle. They were ghost-written by screenwriter Tom Straw. These delicious salty snacks are essentially just Cheetos/Cheese Balls/Cheez Doodles (insert generic brand of corn-based, cheese powder-dusted, crunchy snack that makes your fingertips orange here). But Frito-Lay officially started marketing the Poofs to celebrate the 15th anniversary of the popular animated series, and debuted them at Comic-Con in 2011. They sold for a limited time for $2.99 a bag. Sure, they were essentially just repackaged Cheetos. But do we really care? A focal point of the second Home Alone flick was a small electronic device that Kevin (Macaulay Culkin) brought with him everywhere, and used to record everything from his annoying uncle singing in the shower to clips from a movie (“Merry Christmas, ya filthy animal!”) Portable recorders existed before the movie, but after swarms of kids wrote in to Tiger Toys asking that it actually make the wondrous dual-tape cassette player that could record and play back at variable speeds, altering audio, the company saw opportunity and released the $30 device. It was built to specifications provided by director John Hughes and the movie studio. The Talkboy sold so well, Tiger Toys could barely keep up with the demand. Quentin Tarantino and Robert Rodriguez went to great lengths to create a fake movie trailer that played within their 2007 B-movie double feature Grindhouse. It was called Machete, and purported to star Danny Trejo as the title character, a former Mexican Federale. Surprise, surprise, showgoers seemed more interested in the “movie” being promoted in that trailer than the ones they actually went to see. Thus, Rodriguez went ahead and made the action film, releasing it in 2010. And it was even successful enough to spawn a sequel. It might have started out as a fictional company that Forrest Gump (Tom Hanks) opened to honor his shrimp-loving friend Bubba in the iconic movie, but it’s easy to forget now that the theme restaurant not only exists in real life, but has grown massively over the years to become a chain. Viacom, parent company to Paramount, which produced the movie, partnered with the Rusty Pelican Restaurant Company (also owned by Viacom) in 1995 to bring the restaurant to life, and the first one opened in Monterey, California, in 1996. Today, the Bubba Gump Shrimp Company has more than 40 locations around the world, each featuring tie-ins with the movie via props, menu items, and cheeky messaging.